...the debt-financed model has reached its limit...The battle between debtors and creditors [generations in some economies] may be the defining struggle of the next generation. From an environmental perspective, we have been stealing from the future for the past few hundred years (probably longer than that, and it's accelerated as we've tapped the earth's stored solar energy). From a financial perspective, we're doing the same to support growth, and the maintenance of our "lifestyle". If we're setting up a generational battle, isn't it time to seriously reassess what we're "growing" and maintaining as a lifestyle? Given that ever increasing debt necessitates growth to service the debt, is it conceivable that growth can be environmentally & socially sustainable at the rates required? Here's the trickier question, what legacy will the current generation(s) leave for the ones that follow - Boomers, are you listening? As debtors and creditors, banks and governments are locked in a tight embrace. 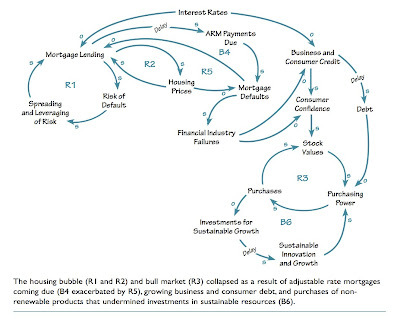 So, given that a system seeks to maintain its own stasis (as I was correctly reminded by a classmate and Founder of Trilibrium, a B Lab certified B Corp focused on triple bottom line accounting) how is it possible that any reform will fundamentally alter what we currently have? Stagnate, default, inflate - they all seem equally grim. The best solution for rich countries is to work off their debts through economic growth. That may be harder for some than for others, given that many countries' workforces are set to level out or shrink as their populations age. So, given that growth is the only feasible option (I am dubious that an increase in the retirement age to allow capable workers to continue contributing to their own future and the next generation's future - remember stewardship - and a reduction in other entitlements is politically feasible, until things get really bad ) how might this be accomplished while maintaining the future's ability to meet their own needs? - What if sovereign debt were measured not only in dollars but also in natural resources and human development quantities. We would then be compelled to grow sustainably to repay those debts. - Imagine if some of the finance industry's 35% of US domestic profits were instead earned by businesses creating real economic value through the provision of products and services that actually met human needs? - Is it conceivable that growth of human quality of life can be maintained by steady-state resource flows in the biosphere? - Is there a way for us to start thinking systemically, to recognize the feedback mechanisms in our systems that we currently miss with our linear/extractive models? The path forward involves a reassessment of what we're growing. Quality of life seems like a good idea...now...about what that means...maybe another post. Certainly, there are pockets of progress, visions and actions of hope and interdependent development that seek to maintain and restore social and environmental capital while increasing quality of life. I suppose the real challenge then becomes scaling non-standard solutions in a system seeking to maintain the status quo.